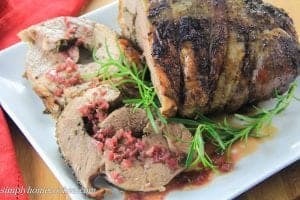 This boneless leg of lamb recipe is marinated in a garlicky herb rub and roasted to tender perfection. It is then served with a savory pomegranate sauce. 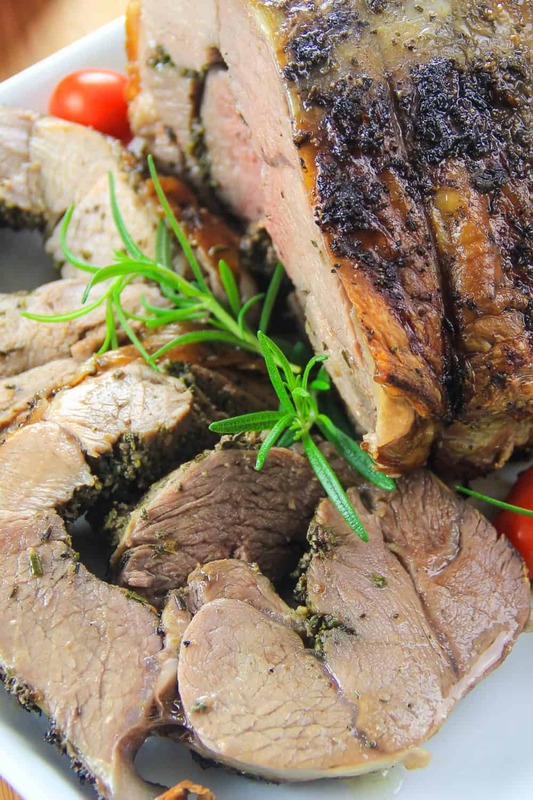 The delicious pomegranate sauce is made from all the roasted lamb drippings, so make sure not to throw them out! This recipe was originally posted on Mar 28, 2015, we’ve tweaked it a bit since then. 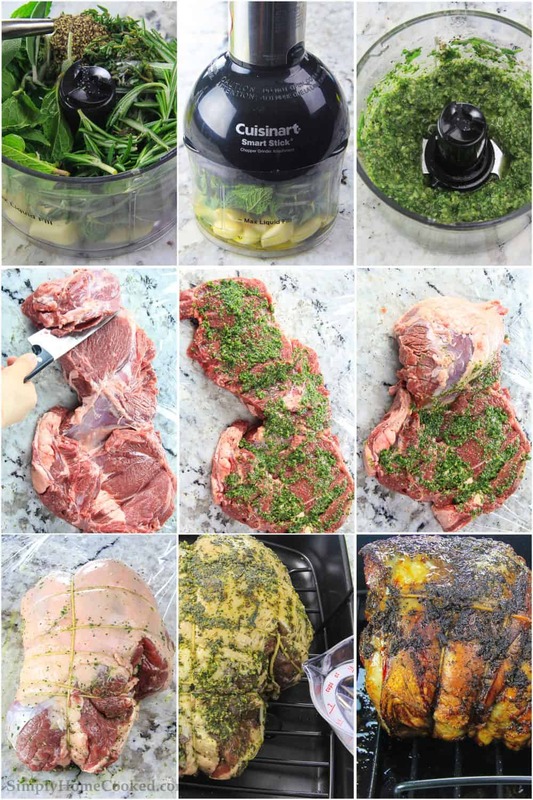 In a food processor, combine the garlic, sage, rosemary, thyme, mint, salt, black pepper, and olive oil. If you don’t want to do this with an entire food processor, I like to use the chopper attachment of my Cuisinart smart stick. Rinse the lamb with cold water, blot it with a paper towel and place it onto the plastic wrap. Using a sharp knife cut slits through the thicker part of the meat to open it up or “butterfly” it open. Season the butterflied lamb leg with salt and pepper to taste. Then rub the garlic and herb mixture onto the lamb, and reserve a little amount for the outer part of the lamb. Roll the meat as tightly as possible. Then tie it together using kitchen twine. Once it’s tied, season the outside with additional salt and the remanding herb rub. 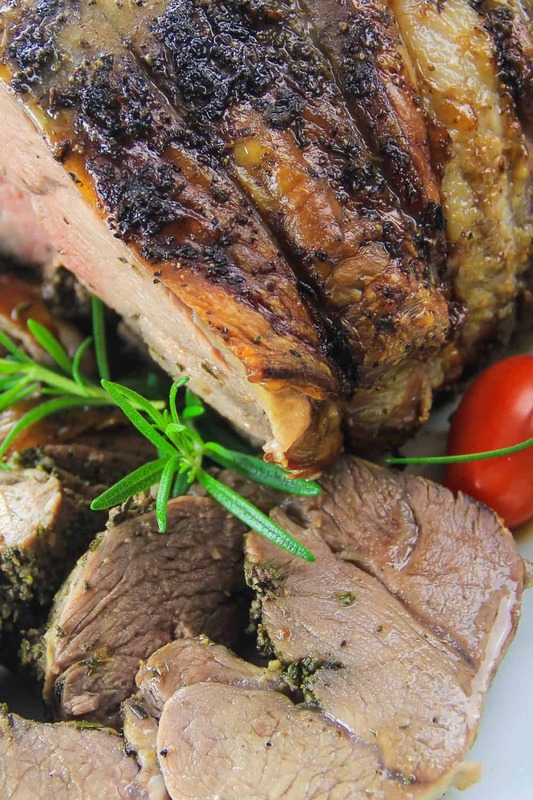 Here is a great video on how to tie a leg of lamb. Cover the lamb with cling wrap and refrigerate. You can refrigerate it overnight or up to 48 hours. place the lamb onto a roasting pan then add just enough water to cover the bottom of the pan. Cook the lamb at 375 degrees Fahrenheit for 2 1/2 hours. In the first 30-40 minutes keep the lamb uncovered. Then lightly cover it with foil and cook covered until done. Using a baster extract lamb drippings pour it into a saucepan. 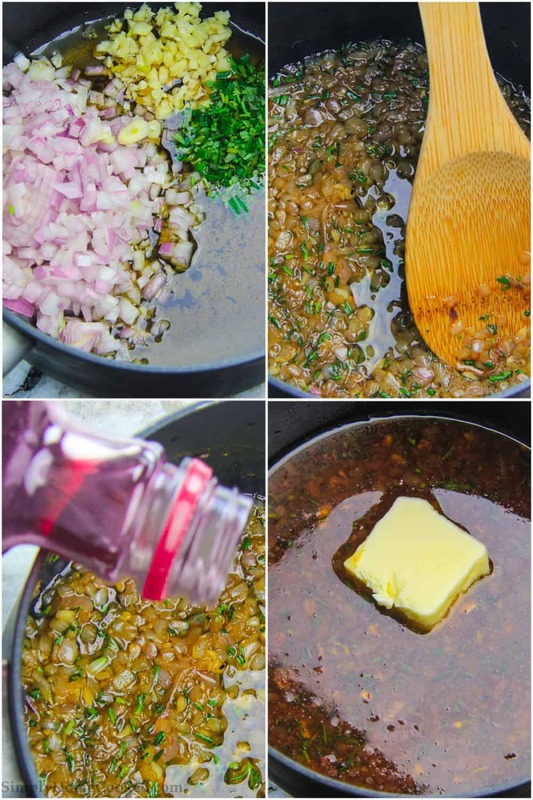 Then bring the drippings to medium-high heat and add the chopped rosemary, garlic, and shallots. Cook until tender. Now add the pomegranate juice, lemon juice, and unsalted butter. Cook the pomegranate sauce for another 5 minutes over low heat, then serve over the roasted lamb. If you’re making this for your Easter feast, make sure not to forget to include some of our favorite Easter dessert recipes at your table. Roasted lamb marinated in garlic and herbs a served with a homemade pomegranate sauce. In a food processor, blend 12 garlic cloves, 1/3 cup sage, 1/3 cup rosemary, 1/4 cup thyme, 1/3 cup mint, 1/2 tbsp salt, 1/2 tsp black pepper, and 1/2 cup olive oil. I didn't want to take out the entire food processor so I used the chopper attachment of my Cuisinart smart stick. Once the herbs and garlic are blended well, set aside. Lay out a few pieces of plastic wrap onto a flat surface. ( I do this for easy clean up). Rinse the lamb with cold water, blot it with a paper towel and place it onto the plastic wrap. Using a sharp knife cut slits through the thicker part of the meat to open it up or "butterfly" it. Roll the meat as tightly as possible. Then tie it using kitchen twine. Once it's tied, season the outside with additional salt and the remanding herb rub Here is a great video on how to tie a leg of lamb. Cover the lamb with plastic wrap and refrigerate. You can refrigerate it overnight or up to 48 hours. The longer the better. Once the lamb has marinated in the fridge, place it onto a roasting pan. Add water to the bottom of the roasting pan. Add just enough water to cover the bottom of the pan. Cook the lamb at 375 degrees Fahrenheit for 2 1/2 hours. In the first 30-40 minutes keep the lamb uncovered. Then lightly cover it with foil and cook covered until done. Cooking time may vary depending on the type of oven and size of the lamb. In the last few minutes of cooking, use a baster to extract 1/3 cup of the lamb dripping from the bottom of the roasting pan and pour it into a saucepan. Heat the saucepan to medium high heat and add 1 tbsp chopped rosemary, 3-4 minced garlic cloves, and 3/4 cup diced shallot (about 1 shallot). Sauté until the shallots become translucent. Add 1 cup of pomegranate juice, 1 tbsp freshly squeezed lemon juice, and 2 tbsp of butter. Stir the sauce for another 5 minutes over low heat and serve over the lamb. This recipe was originally published on Mar 28, 2015, it has been updated since. I’ve always been sort of intimidated to cook lamb…this is refreshing.